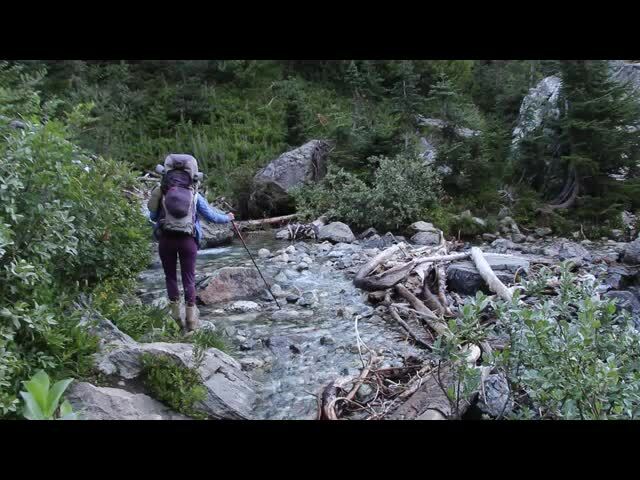 We spent our final day of the trek hiking out from the Spider Glacier via Spider Meadow on the Phelps Creek Trail. Our original plan was to wake up early so that we could get hiking by dawn. Why? Because the sooner we got hiking, the sooner we would be partaking in the joys of civilization. Namely, those joys such as hot showers, fine dining, and comfy beds. 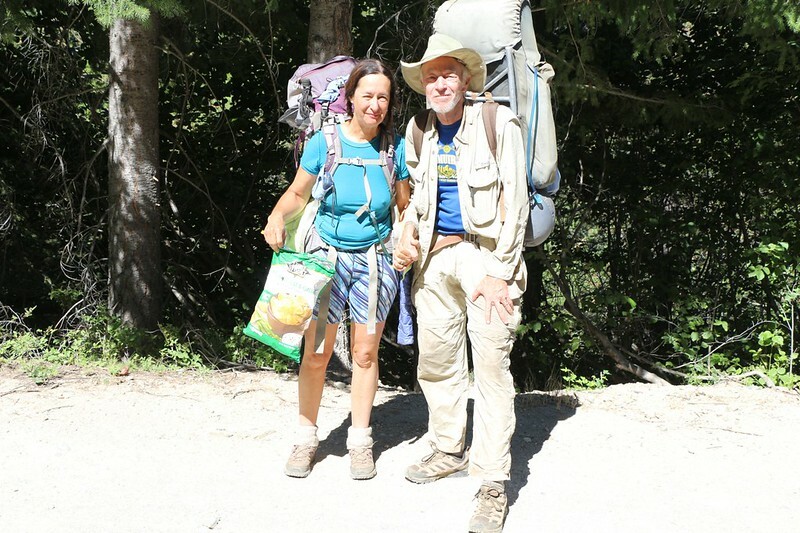 Sure, we loved backpacking, but after ten days in the wilderness we were more than ready for a change. We felt this longing from deep inside. In literary terms, Jack London might have written of this human instinct as the “Call of the Mild.” We naturally prefer peace and plenty over hardship and privation. And that’s as it should be. We intended to wake up at 4:30am or so, but it didn’t work out that way. At about 3am I awoke due to a strong smell of dust in my nostrils. It felt dry and nasty, and I knew that something was wrong. I turned on my headlamp and immediately noticed the huge quantities of dust suspended in the air. The tent was shaking and the wind was gusting in fits and starts. As the tent billowed and shook, the dust motes danced back and forth in time with the tent’s motion. And I was breathing them. Now, the earth under the tent was a very fine particulate matter (namely: dust) just as it had been nearly every night we’d camped out here. My theory is that it is actually volcanic dust deposited during past eruptions of Glacier Peak, which previously erupted only 300 years ago. But that didn’t matter now. The important thing was to find out where the dust was coming from and stop it. We’d end up with serious respiratory problems if this continued much longer. Because we were perched on top of a cliff, the wind was misbehaving even more than usual, and was causing the tent to inflate and deflate like a gigantic bellows. Our tent was normally well-sealed along the bottom, except under the doors in the front, and my headlamp made it clear that the corner near my feet was the source of the dust. Every time the tent inflated, it sucked in another dusty cloud. This had to be stopped, somehow. I tried a few things, but in the end the only thing that worked was jamming my hiking shoes into that corner, and piling other gear on the nylon vestibule cloth. I also closed the vents on the roof. I sat there and waited for awhile, as the gusts were infrequent and varied. I watched the dust slowly settle down, and with my hands I felt the layer of gritty silica powder coating our sleeping bag. Indeed, everything in the tent was coated, even the insect screening. Every time I touched anything, or moved too quickly, another cloud of dust arose. I laughed a bit to myself when I realized that dust was one of the risks you take when you live too close to a volcano. And then I went back to sleep. I was glad that Vicki hadn’t woken. She could find out about it later. At 4:30. Just the same, after a fitful sleep full of dreams about choking in dust storms, I woke up well before the alarm. I turned on my headlamp to survey the tent. Yes, this part wasn’t a dream. Everything was dusty, and my side was the worst. Vicki was lucky as her head was furthest from the dust-puffer zone, and most of her stuff was OK. On my side, I had to touch everything slowly, so that I wouldn’t stir up even more dust. I woke up Vicki gently, and warned her about it. We came up with a plan to treat the dust in the same manner as we would deal with wet gear and clothing. We folded back the sleeping bag and made a “dry” dust free area where we could get dressed in our day clothes. The foot of the tent would be the “wet” dust-zone. And it worked! Soon enough we were dressed and ready to pack up everything. Luckily, since this was the last day of the trip, I didn’t care too much about how well it was packed provided that it fit inside the backpack, and so I ended up carrying a whole lot of dust on the way out. Call it a souvenir. It was just getting light when we hiked out of camp. We had to hike quietly at first because there was another tent not far up the hill from us, but after that everything was easy. 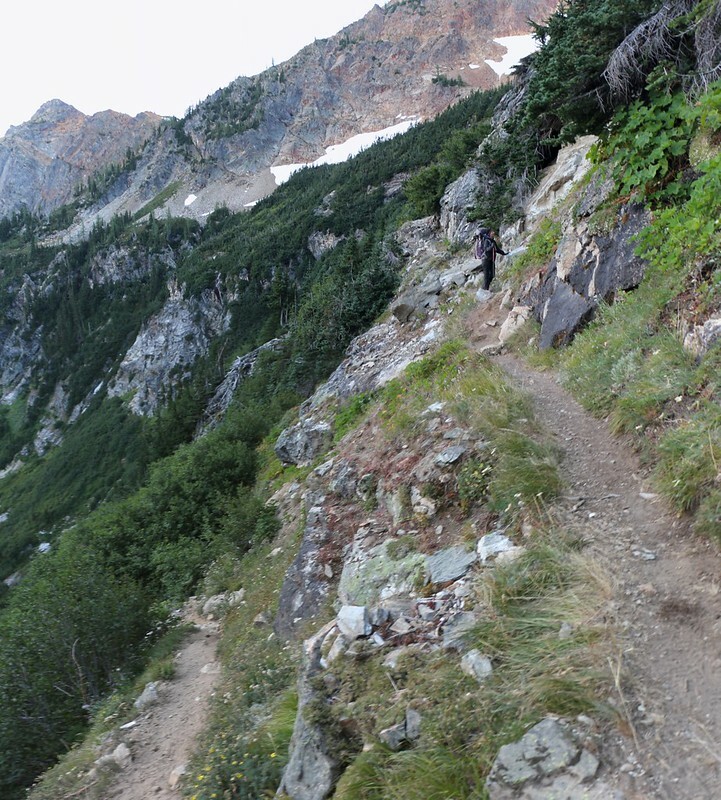 It was all downhill, with plenty of switchbacks, as the trail was descending along what most people would call a cliff. 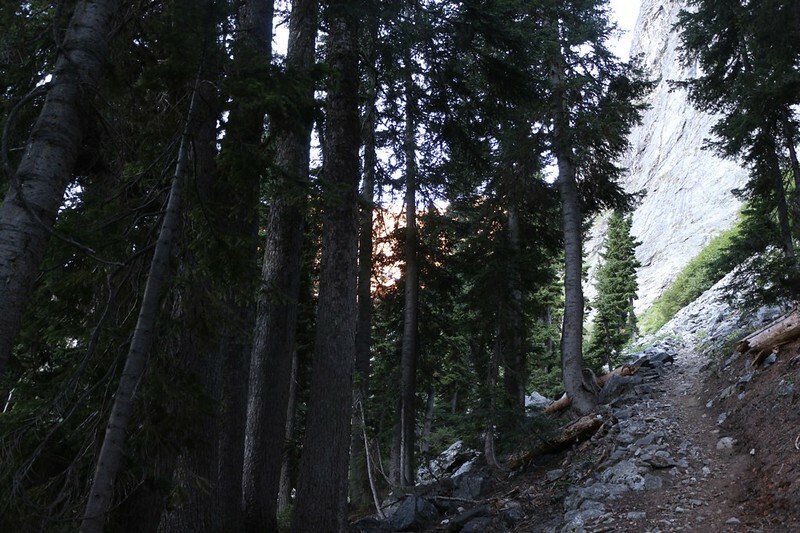 It was the headwall of the main canyon. The trail generally followed the easiest possible path, but there were plenty of spots that were just plain steep. We had a fun time all the way down. We ate our breakfast as we hiked. The views were great, and the morning was cool and crisp. We couldn’t have asked for a more beautiful day. 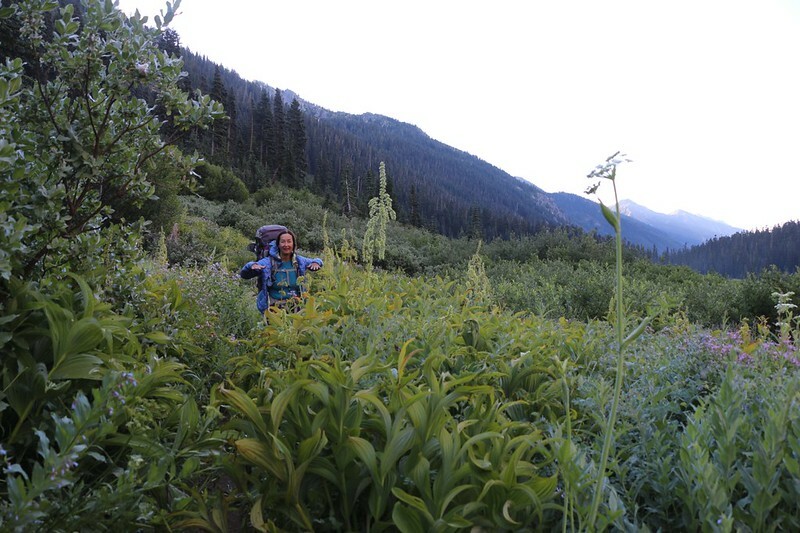 And let’s face it: Downhill is Vicki’s favorite style of hiking. She was flying down the trail. We had seven miles to hike and 2700 feet of elevation to descend, and we were really cranking it out. 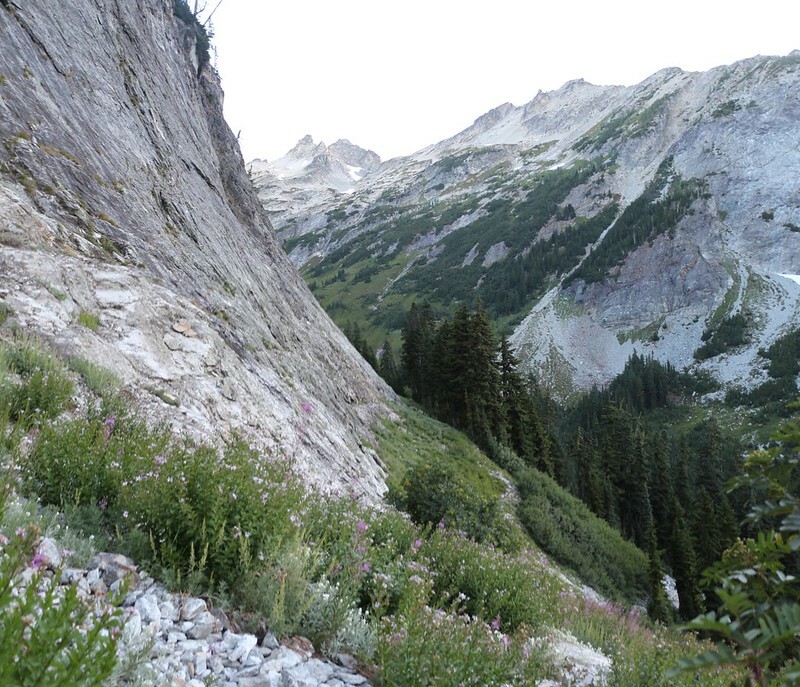 Eventually the trail got low enough, and the headwall’s slope shallow enough, that we entered the forest. The trees were very tall and it was rather dark under the canopy, even though the sun was shining high on the mountaintops on the west side of the canyon. It was quite peaceful in there. Soon enough we reached the bottom of the canyon and the Spider Gap Trail ended (or began). 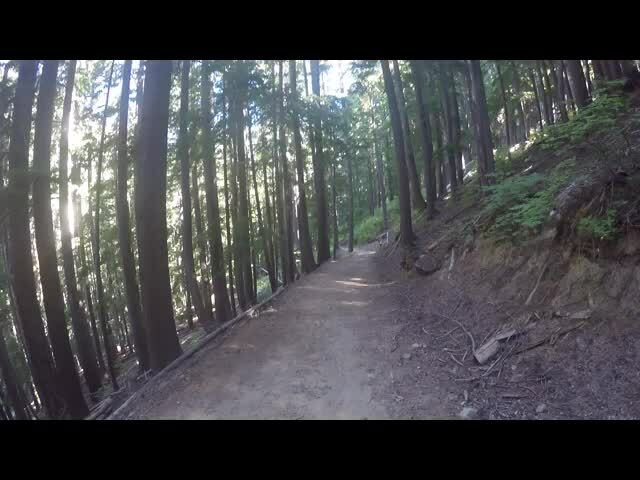 We turned right and continued downhill on the Phelps Creek Trail. It didn’t take long before we broke out of the forest and entered Spider Meadow. We’d been staring down at it since yesterday afternoon from a thousand feet above, so we were looking forward to seeing it up close. It was about a mile long, and was extremely lush, with Phelps Creek meandering down the middle of it. There were a number of campsites down here, and they were at a perfect hiking distance from the parking area for a weekend backpacking trip. We saw smoke rising from one of them, even though fires were banned until September. Some people don’t seem to be able to survive without a campfire, or don’t consider it “true” camping if they don’t have one. There were flowers everywhere, and many of the plants were chest-high. We had to push right through them without being able to see the actual trail down below at our feet, and they were all wet with dew. Soon enough, our pants, our shoes, and even our jackets, were soggy and cold. We almost wished that the sun would hurry up and dry out all that dew, but not really. We knew that it would roast the two of us, as well. There was plenty of time for that later, we decided. We love hiking in the cool of the morning. That’s why we get up so early! Along the way, we stopped here and there to take photos of flowers, or to pick blueberries. We kept looking back at the end of the canyon, trying to determine precisely where Larch Knob and our recent campsite was located. We wondered if our friend from the day before was looking down at us as he sipped his morning coffee. We could see that the sun was already shining bright far above us on the glacier, while it was still nice and shady down here. 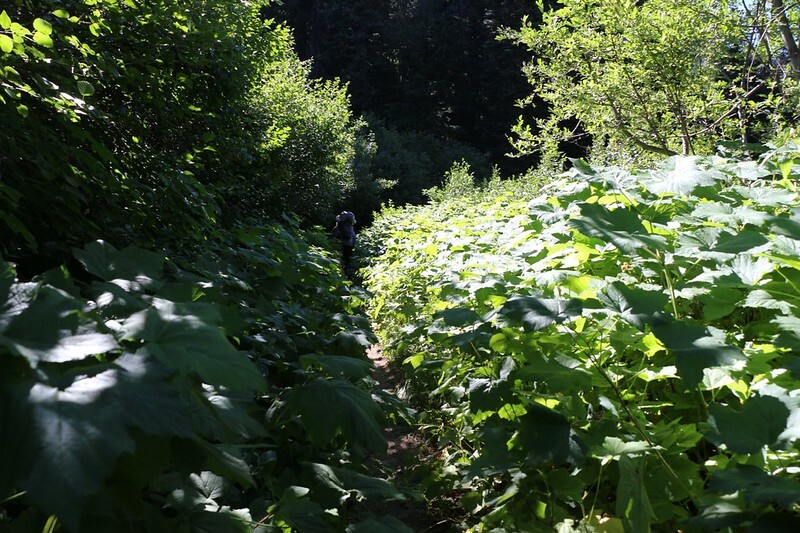 The trail travels through some chest-high dew-soaked plants – Soggy! 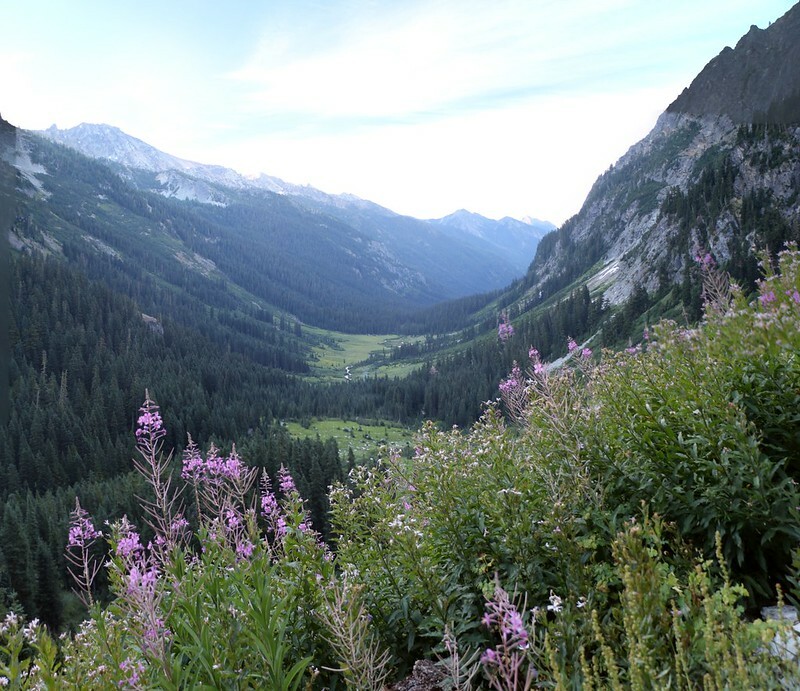 But all good things, including Spider Meadow, must eventually end. Tall pines stood like a wall at the lower end of the meadow. There was a large campground down there, and another set of campsites were across the creek to the west. We decided to take a short snack break while I checked my GPS. We had about five more miles to hike to reach the car, most of it through forest. Even cruising downhill, it would take us a few hours. We only had a tiny bit of food left in our packs, and the snack selection wasn’t great. The big packs were also feeling rather light compared to the beginning of the trek. Most of the time we bring too much food with us, but this time we did it just right. As we hiked into the forest we noticed that the sun was getting higher, and the shadow of the mountains to the east were getting shorter. Soon we would be in the sun, but a sunlight tempered by trees. Shafts of bright sunbeams struck the forest floor, lighting up patches of leaves and flowers, while all else remained in shadow. But it wasn’t all forest. 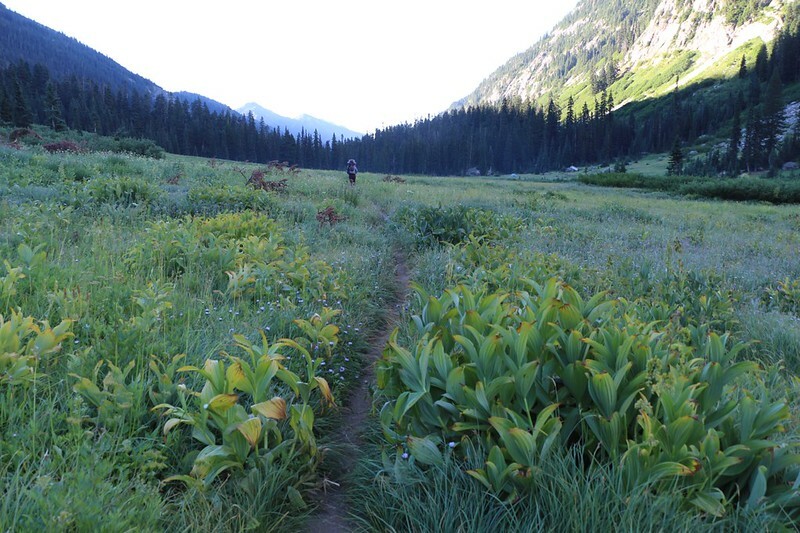 There were tiny meadows filled with sun and flowers, and Phelps Creek was never too far away. We could hear it tumbling over rocks and roaring when it cascaded over a log, ledge, or boulder. It kept getting larger and louder as we hiked, as it was being fed by more and more side-streams pouring down across the trail from melting snowbanks high above us. 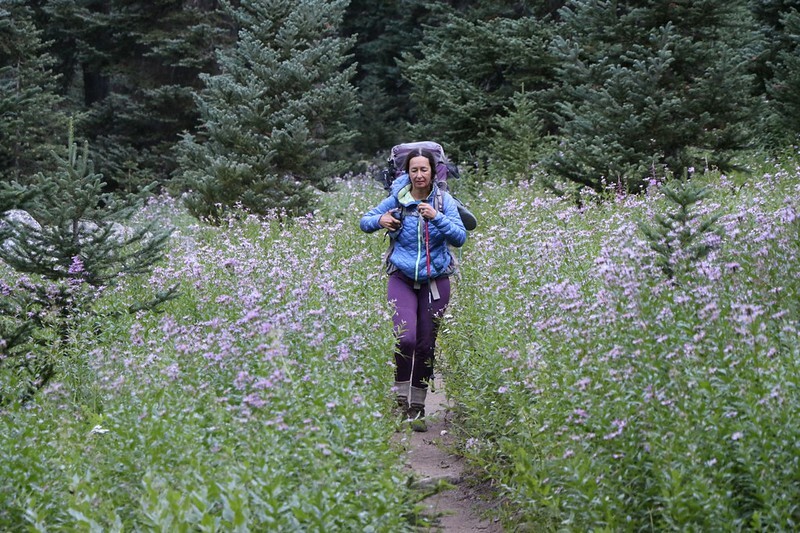 A small flower-filled meadow – they match Vicki’s outfit! After four miles of hiking we came upon the Wilderness Boundary. The trail was more like a road beyond this point, and may have been used by mining vehicles in the not-too-distant past. It became obvious that the miners were the ones who created the road (trail) as there were the remains of bridges where it crossed some larger side creeks. There were also some property markers. We thought this might mean that we were almost back at the car, but a quick check of the GPS showed that we still had three miles to go! 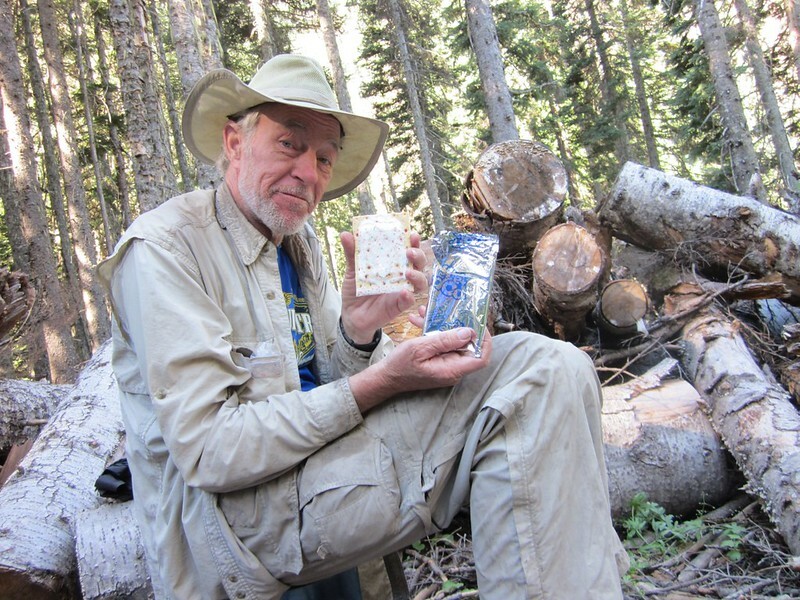 After ten days of hiking I still have a perfectly undamaged Pop-Tart to eat for lunch – almost a miracle! So we kept on hiking. It was fun to be able to hike side-by-side on such a wide trail. We held hands and talked about the trek, about what went right and what went wrong. What went wrong? Well, it was an impressively short list. We didn’t get hurt, our equipment didn’t break, and we didn’t get lost. Our only real complaints were about things that we had no control over, like the heat wave that roasted us the first few days, and the endless swarms of annoying, in-your-face, leg-biting Deer Flies that plagued us during the heat wave. Hiking uphill for two days on the Buck Creek Trail in the heat with those flies in our faces was almost enough to make us turn around. And the area of burnt forest that we camped in the first night was certainly ugly, but it was also informative and sobering; it was a true counterpoint to the beauty that awaited us afterwards. What went right? Almost everything! After the first two days, that is. 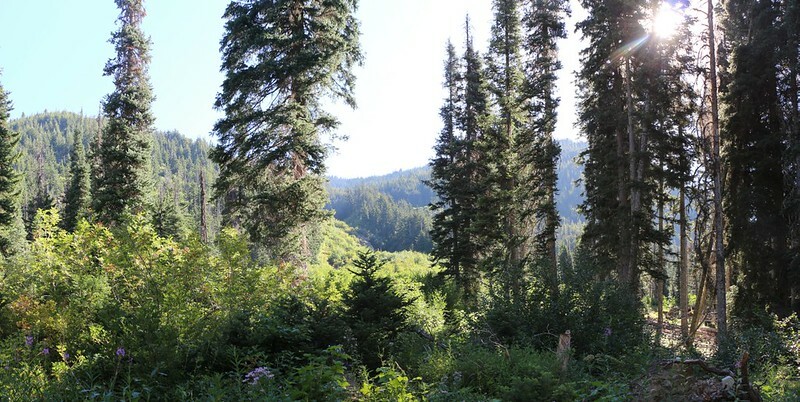 Once we reached the campsite at Buck Creek Pass the second night, it was nothing but continuous improvement. Although every day was good, four days were absolute highlights. All in all, it was a trip to remember. 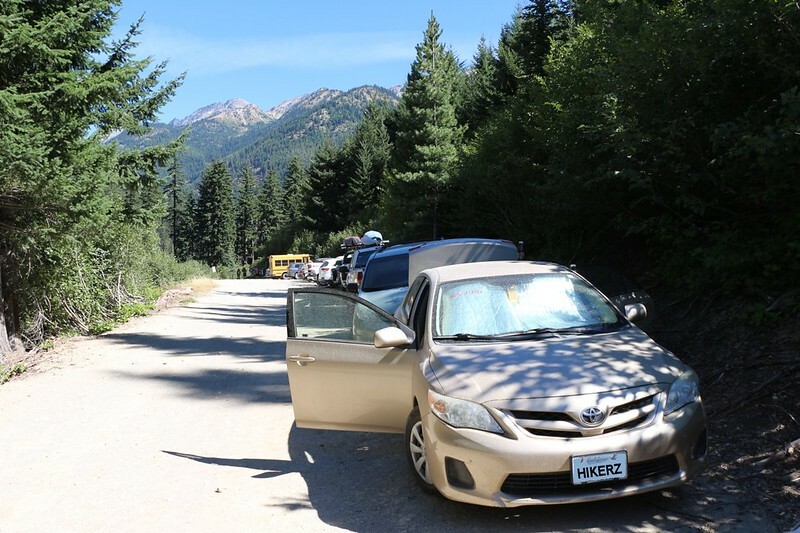 Day 1, when we parked the car and began our long hot climb up the Buck Creek Pass Trail, camping in the midst of the forest that had burned the previous Summer. There were Thimbleberries to eat and a broken bridge to cross. 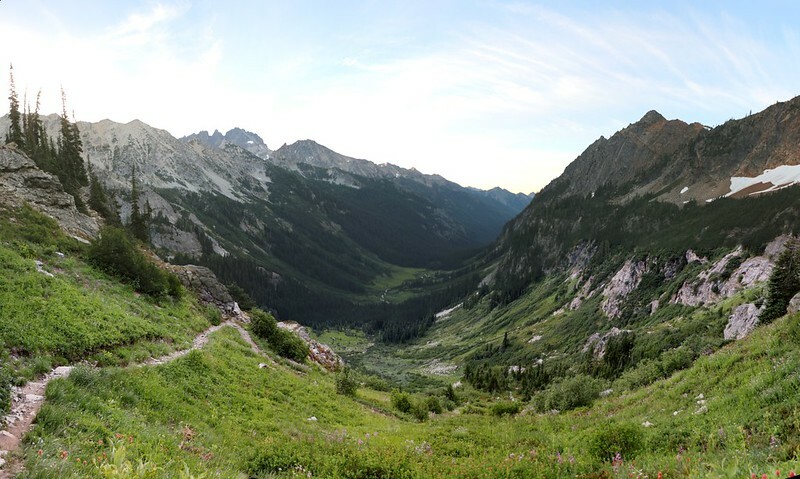 Day 2, when we hiked uphill for miles, but left the burned zone early and passed into healthy forest and flowery meadows, and at the end arrived at Buck Creek Pass where we claimed the best campsite with a good breeze and views out west to Glacier Peak, the ten thousand foot namesake of the wilderness area. It was such a relief to get there! 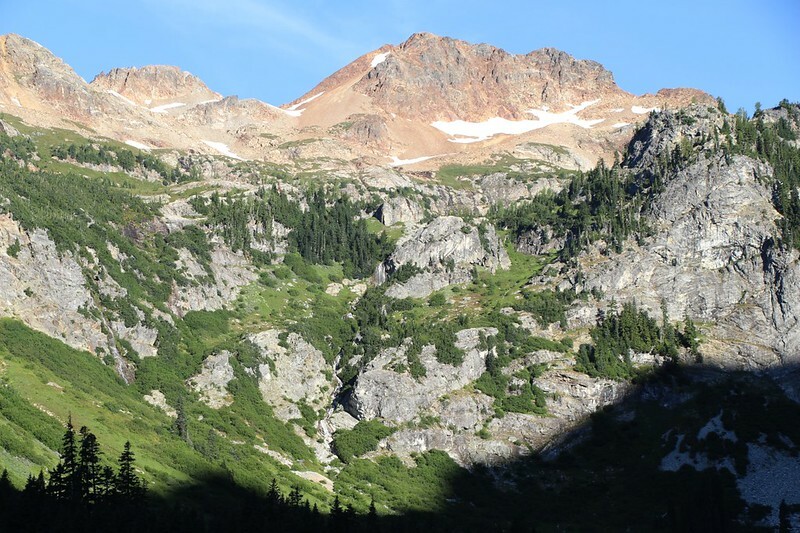 Day 3, when the hazy air had cleared overnight and we saw Glacier Peak in all it’s dawn glory, followed by our day-hike on the High Pass Trail around Liberty Cap, along a wildflower-covered ridge where we gained fine views of a high mountain lake. 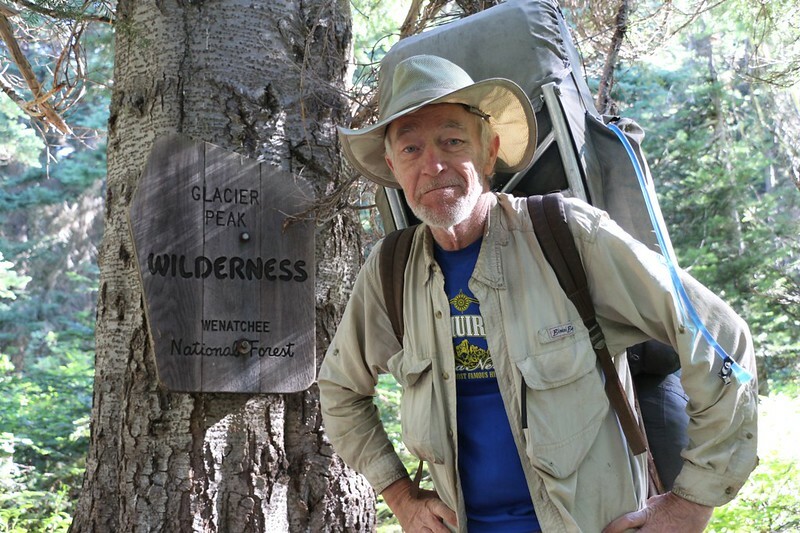 Day 4, when we hiked northward and stopped for lunch on Middle Ridge, where we took a long rest inside our screened-in tent to avoid the Deer Flies (the final day of Deer Flies! 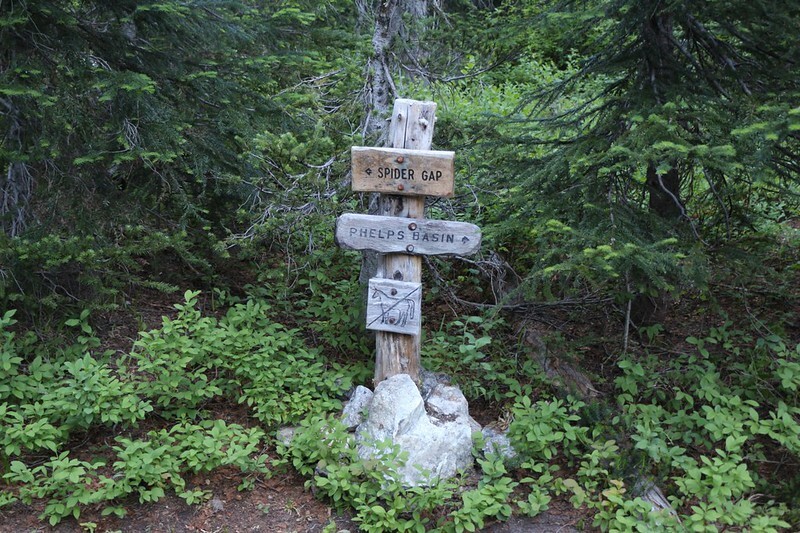 ), followed by a long descent to Miners Creek on the PCT. 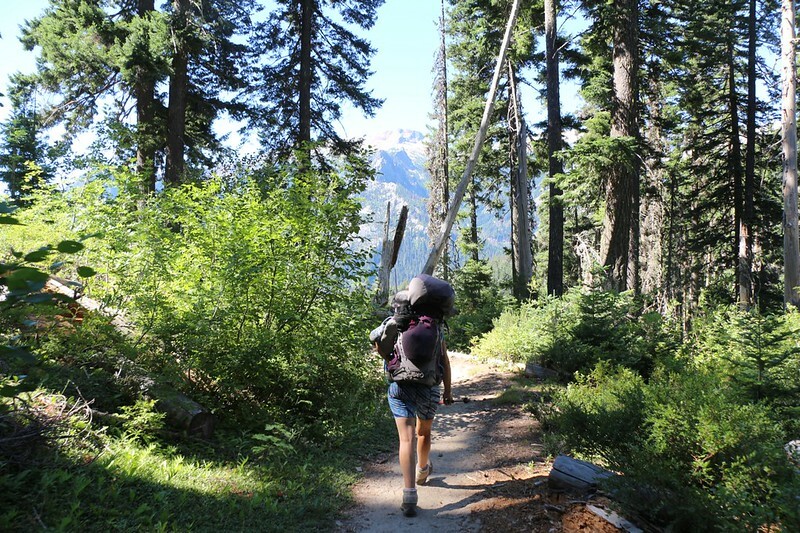 Day 5, when we hiked at dawn, uphill all the way, past millions of blueberries to Image Lake, a true gem in the wilderness, followed by a day-hike to the Miner’s Ridge Fire Lookout Tower with its panoramic views of Glacier Peak. Day 6, when it rained during the night so that we had to pack up and hike back to the PCT in misty blowing clouds, and the weather grew cool and breezy as we crested Suiattle Pass and continued climbing on the awesome and fun Hikers Trail all the way to Cloudy Pass. 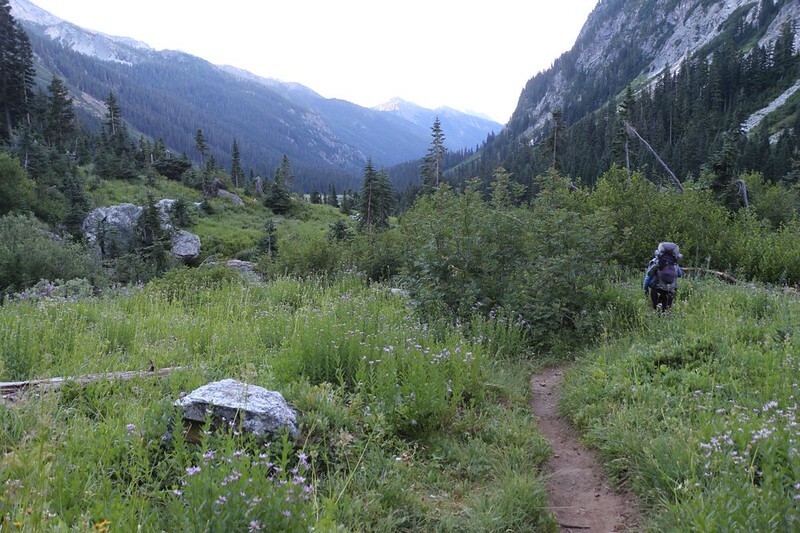 Day 7, when we moved our tent 100 feet, then day-hiked from our now-perfect campsite at Cloudy Pass up to the summit of Cloudy Peak and were rewarded with incredible views in all directions, but especially down into the Lyman Lakes basin. Day 8, when we headed down to Lyman Lake, and took a side-tour of two waterfalls further down Railroad Creek, then continued climbing on the Lyman Lakes Trail to a beautiful campsite overlooking Spider Gap and the Lyman Glacier, followed by a day-hike to visit the Upper Lyman Lakes and see the Lyman Waterfall. Day 9, when we climbed the mile-long snow-chute up to Spider Gap and glissaded down the Spider Glacier to our campsite on Larch Knob, that had such excellent views down into Spider Meadow. 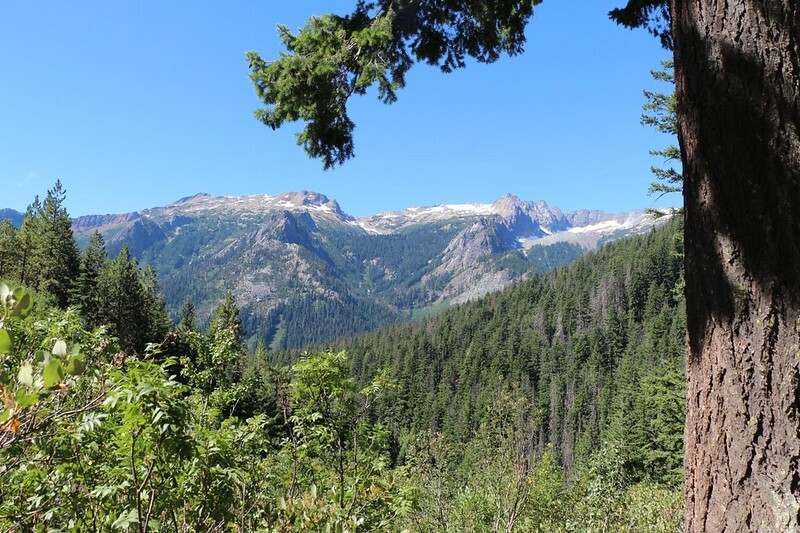 Day 10, when we hiked downhill from Larch Knob to the Phelps Creek Trail along Spider Meadow and through miles of peaceful pine forest to our car at the trailhead. Every day was beautiful in its own way, although several certainly stood out from the rest. All in all, it had been an amazingly wonderful trip. It was one of the best treks I’ve ever been on. Highly recommended. In fact, this trip had been so good that I had no choice but to take back all those harsh words I’d said in the beginning about the State of Washington. The state hadn’t merely won a reprieve from being ostracized, it earned my outright praise! Yes, it’s true: Washington State is absolutely magnificent, and I’m hoping that I have the opportunity to come back and enjoy even more of its beauty in upcoming years. So there. I said it. 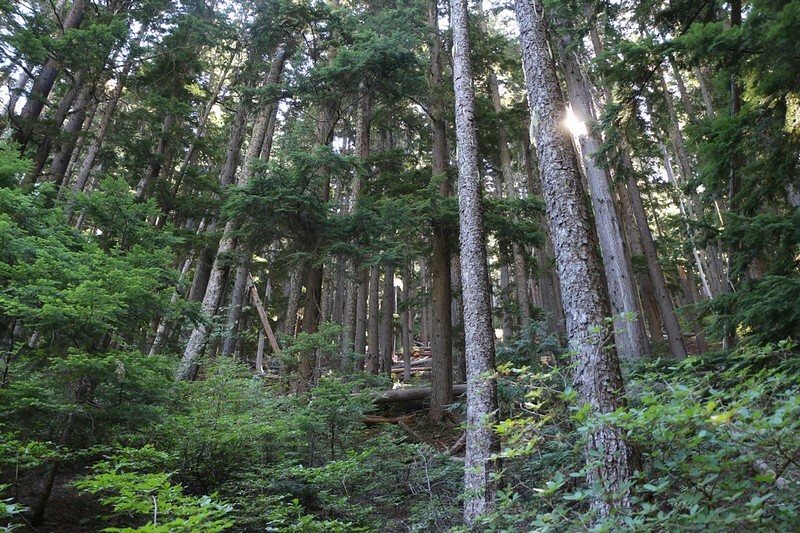 We continued hiking along the wide, flat trail and entered a forest with very tall trees. 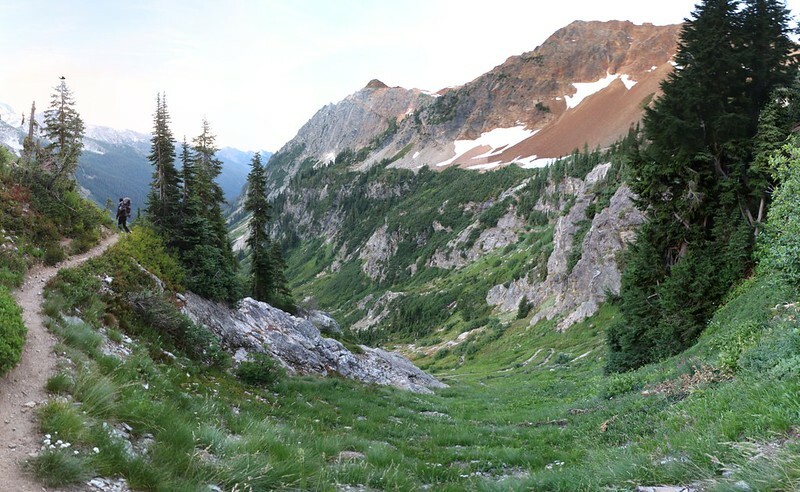 The creek dropped away on the right while the trail stayed up high on the side of the sloping valley. It was cool and dark, and the air smelled like pines. We imagined what it would be like hiking here in the springtime, with everything all soggy from days-long misty rains, in the true Pacific Northwest fashion. Just the same, what we really wanted was at least one more decent view of some mountains before the hike ended. And the trail didn’t disappoint! It broke out of the tall pines and showed us the Chiwawa River Valley down below, and the high snowy ridge up above. The Buck Creek Trail began somewhere down there, the place where our journey started ten days ago. 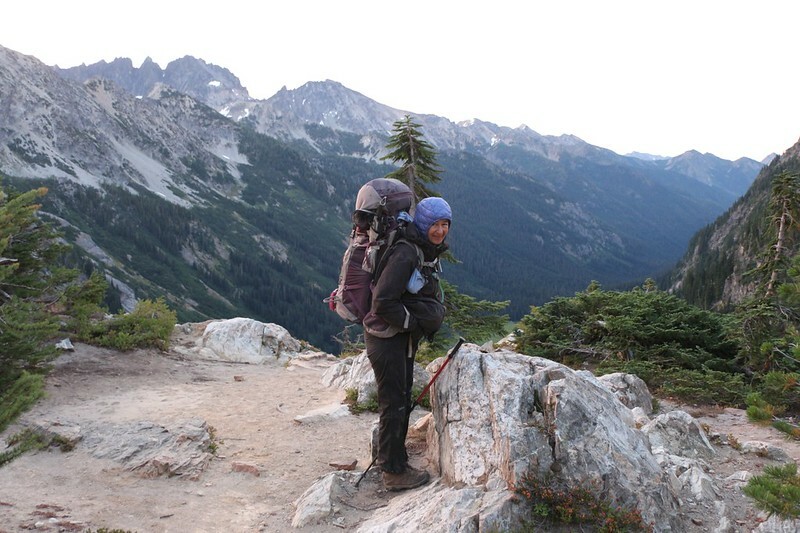 Eventually, after what seemed like an awfully long time, we arrived back at the trailhead. 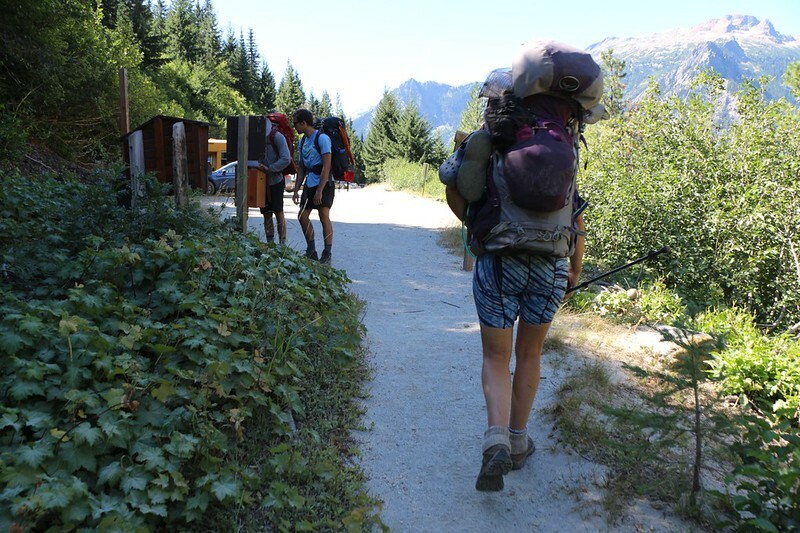 We met some fresh new hikers just starting out on their own adventures in the wilderness. They looked so clean in comparison to ourselves. We were filthy from the trail, our legs caked with trail dust and our hair all wild but hidden under our hats. We knew that our unbathed bodies reeked of sweat, so we stayed downwind of them while we were talking. We spoke of the trail just ahead, and of the glacier they’d be climbing soon. We wished them a safe and happy journey. And then we headed on down to the car. Most of the vehicles parked along the side of the road were dusty, and ours was dustier than most. I got out the key and unlocked the car. I popped the trunk and Vicki immediately grabbed a bag of salty potato chips. She wanted to take off her pack but I wouldn’t let her. I insisted that she pose for an “after” shot with the two of us, because we’d taken a “before” shot when we arrived. It was photographic proof that we’d been on a long trek in the wilderness. We took the photo, then I, too, grabbed some food from the trunk, plus a sweet can of soda to drink. I sucked it down as we took off our packs and stowed the gear away. Aaahhh! We got out our bag of “car clothes” and looked at them longingly, but realized that our bodies were far too filthy to wear them. We compromised by changing our shoes and socks, and that made us feel better immediately. 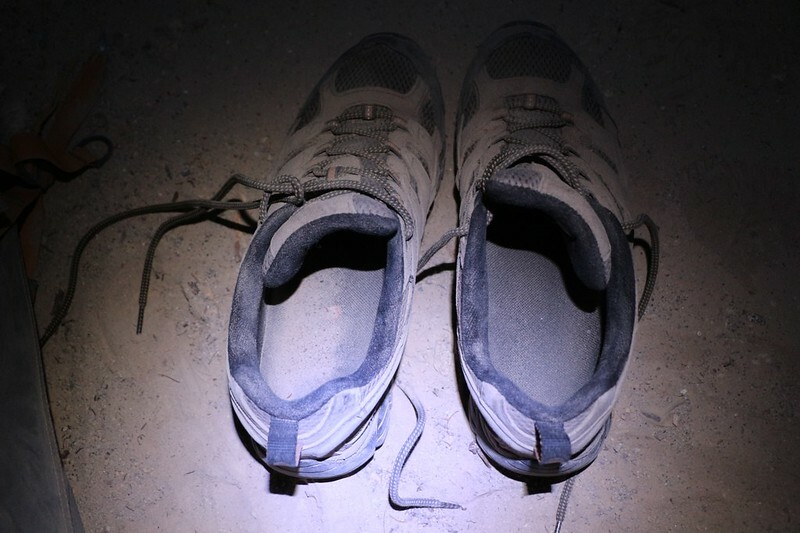 We shoved the sweaty dusty hiking shoes into the trunk and got in the car. I looked at my watch: It wasn’t even noon! We had plenty of time to make it back to Leavenworth where we would eat a hearty lunch. And take a shower in the motel, and finally get some laundry done! And then eat a huge dinner! Oh yes, we were feeling the call of civilization. We realized that there’s a reason why we spend so much of our time there: Because it helps us do so many great things. Including escaping from it to visit the wilderness. 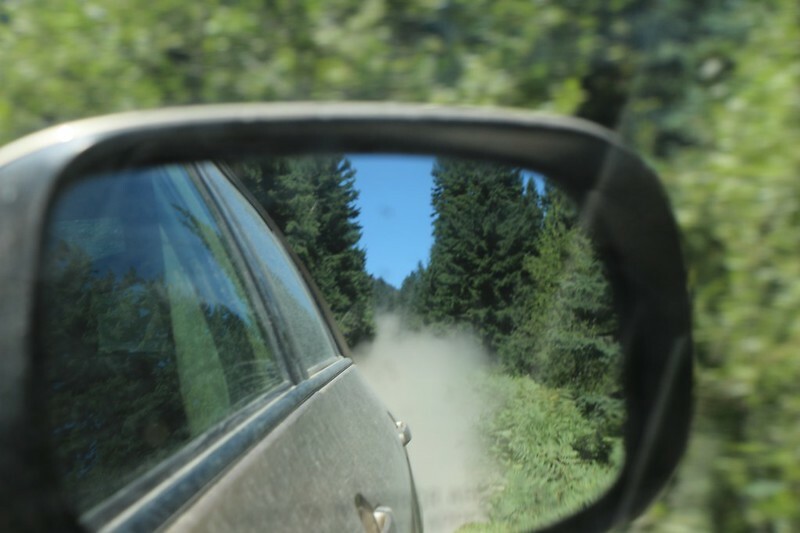 Dust clouds in the rear-view mirror as we drive back to civilization – Good-bye Glacier Peak Wilderness!